The position of Barby village, midway between Rugby and Daventry, on the side of a hill overlooking the Rainsbrook and Leam valleys, has given rise to much speculation as to its origins. The location of its first dwellings and the reasons for their existence are even now being researched through archaeological investigations. For further information on the Barby Hill Archaeological Project click here. The West Northamptonshire Local History (WNLH) website contains detailed historical information on Barby, Crick and Kilsby as well as a variety of historical topics all associated with West Northamptonshire (Note you need to register for free with WNLH to get access to these topics). Although the origin of Barby’s name is the subject of some speculation, what is not in doubt is that the village existed, well before Domesday. In 1068 the lordship was given by William I (‘The Conqueror’) to William Peverel, whose main property lay in Nottingham. The earthworks from a Norman castle can be found on the northern edge of the village, off Castle Mound road. The parish of Barby includes Onley, which lies to the west, beyond the Oxford canal. Once a deserted mediaeval village, Onley is now home to a large prison complex. The site was used during and after World War II, firstly as a supply depot, then as a prisoner-of-war camp. The present complex has been developed from a Borstal, built in 1969. Today, most of the houses provided originally by the Home Office for prison officers are privately owned. At the census taken in 2001, the institutional population at Onley constituted about a third of the total for the parish, 743 out of 2083. Until 1884, when it was amalgamated with Kilsby, the detached hamlet of Nortoft belonged to Barby parish. It is now being absorbed into development at the Daventry International Rail Freight Terminal (DIRFT), the logistics park at Junction 18 of the M1 motorway. Today, Barby is thriving. Although the population remained stable during the 19th and early 20th Century, it fell to a low of 427 in 1961, endangering the future of the village school. Housing development in the 1960s ensured rapid growth, and a new school was built. Barby is now an infill-only village, with small-scale development to satisfy local need. Many of those arriving in the 1960s were employed in engineering, working in Rugby and Coventry. 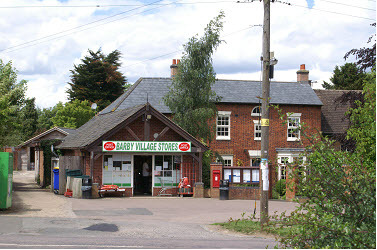 Previously, Barby had been an agricultural village, occupied by farm workers and associated tradesmen, although a small factory building in the village centre has been in existence since the 1950s. This building first housed an engineering firm, then Andrews Maclaren’s Baby Buggy company, and now a wood-turning workshop. Earlier village trades included weaving – there were 10 weavers in an adult male population of 54 in 1777 – and domestic shoemaking in the late Nineteenth Century, before the trade in Northamptonshire became factory-based. 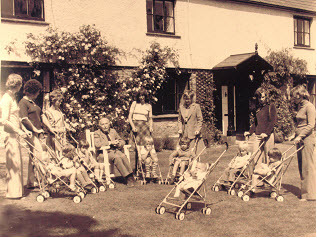 The earliest models of the Baby Buggy, designed by Owen Maclaren in 1965, were made by local people in the stables behind his home at Arnold House. The Baby Buggy was the world’s first umbrella folding baby stroller, and today the modern version of the 'Baby Buggy' are sold in over 50 countries under the Maclaren brand based in nearby Long Buckby. The stables at Arnold House were formerly used for polo ponies. Arnold House is one of many interesting buildings in the village, some of which are listed. 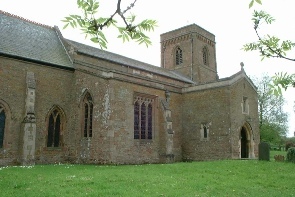 The most significant of the listed buildings is St Mary’s Church, built mainly of pink sandstone. The church contains some Saxon remains, but the present construction dates from the Thirteenth and Fourteenth Centuries. However, mediaeval wall paintings were lost when the church was ‘restored’ in Victorian times. More recently, in commemoration of the Queen’s Golden Jubilee, a fifth bell was hung in 2002, to complete the peal housed in the tower one hundred years previously, and restoration of the external stonework was carried out in 2011. There is a busy social life in the village, centred on the Village Hall, the extended and modernised Victorian school building erected in 1865. 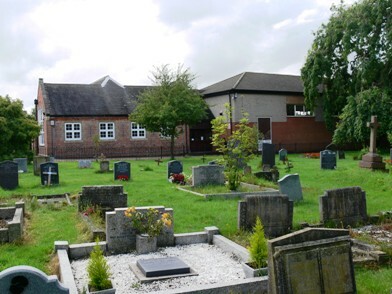 When the previous village hall (established in a redundant prisoner-of-war camp) was demolished, some of the materials were used to build a cricket pavilion, on ground owned by the parish’s Townlands Charity, outside the village near the then derelict mill. The mill has since been converted into a private residence and the original pavilion has been replaced; the new pavilion has become another centre for social activity. Onley now has its own village hall. 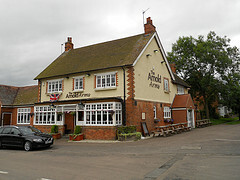 Only The Arnold Arms, one of the half dozen public houses of the Nineteenth Century, has survived into the Twenty-First Century.